Famous Hollywood star Will Smith visited Haridwar recently and shared his experience on social media. In his latest pictures that are going viral on the internet, he can be seen performing prayer by folding his hands, doing other devotional rituals. He can also be seen in the famous Ganga Arti at Haridwar. Another picture shows him in a deep spiritual conversation with an Indian priest. He is also seen performing the puja by offering fire to river Ganga. The actor took to Instagram and posted some stunning pictures from his visit to the place. The caption of his post reveals that the ‘natural beauty’ and love from India have ‘awakened’ him. Will wrote in the caption, “My Grandmother used to say, ‘God Teaches through Experience’. 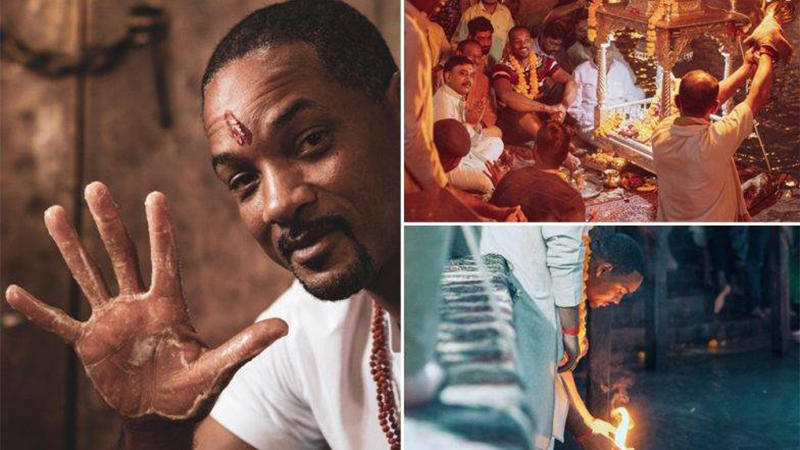 While the main reason for Will Smit for visiting Haridwar is to shoot for his Facebook Watch show Will Smith’s Bucket List but he has also visited the country twice earlier for professional and even personal reasons. The last time he visited the country, he shot for a quintessential Bollywood song in Karan Johar’s Student of The Year 2. He shook a leg with actor Tiger Shroff in the song and ticked ‘Bollywood dancing’ off his bucket list. He described his experience as a ‘dream come true’.